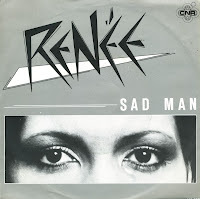 'Sad man' was released as the third single from Renée's 1980 album 'Reaching for the sky'. The single was promoted for a couple of weeks, but then the record company's attention went towards the Stars on 45 project, which eventually became an international hit. 'Sad man', meanwhile, suffered. Although 10.000 copies of the single were apparently sold, it did not land in the Dutch Top 40. 'Come closer' is another single by the Dutch band Renée that didn't make the Dutch Top 40. Not that the track wasn't promoted: several television appearances have survived the three decades since its release (see here and here). I didn't like the song when it came out, but I appreciated it more in hindsight. This is why I bought the single 20 years after its original release. Renée was originally called René and the Alligators, and only changed names when Anja Nodelijk joined the band. Before they moved into the pop scene, they released a few singles that were true to their rock 'n' roll roots. 'Sweet nothings', released in July 1978, was their first hit single, peaking at number 14 in the Dutch Top 40. The B-side is a firm reminder of the band's previous incarnation. 'Jimmy' was the fifth single release from the Dutch band Renée, released in June 1980. It was the first single taken from the band's 1980 album 'Reaching for the sky' and it was received positively by critics and DJ's. The single did not break the Dutch Top 40, which was disappointing after two hit singles. 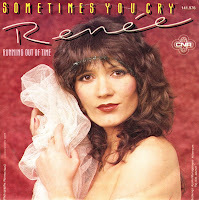 Released as a single in 1982, Renée had no success with 'Give me a break', a track from the compilation album 'Sometimes you cry'. The song sounded a lot like previous singles from the band, and presumably the listeners had had enough of the band. Although they continued to perform live for years, they would have no further chart success. The Dutch group Renée achieved their biggest success with the single 'High time he went', taken from the album 'The future none can see'. The story of a man with a midlife crisis reached number 8 in the Dutch Top 40. The group's biggest success was also their last: subsequent singles failed to chart, although one further album and associated singles were released. The influential Dutch DJ Frits Spits was already a fan of the song 'Seventeen' when the previous single 'You're a liar' had just been released. Both tracks were taken from Renée's successful 1982 album 'The future none can see'. Despite this strong radio support, 'Seventeen' still failed to reach the charts when it was eventually released. The lyric of the song is a tale of a young woman who goes out with a boy next door and then gets raped. Not your average song material, but told in a few lines with strong musical backing, it really grabs the listener. Not bad for a Dutch production. René and his Alligators were founded by René Nodelijk in the sixties. Playing mainly covers of popular rock and roll tracks, they were a hit on Dutch stages. When René met Anja Exterkate in 1976, the idea of changing the band name to Renée and his Alligators was made in due time. When the band signed to CNR Records, they shortened the band name to Renée. They released several albums and singles between 1978 and 1983, and 'Sometimes you cry' was the last one to reach the Tipparade, the 'bubbling under' chart for the Dutch Top 40. It's an energetic, poppy track with a catchy chorus.